To celebrate the Year of the Dragon, S.T. 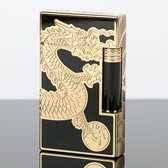 Dupont has produced this astonishing Limited Edition, trimmed in gold and black Chinese lacquer and beautifully engraved with a golden dragon. S.T. Dupont Dragon Limited Edition is made up of a Line 2 Premium lighter and a Néo-Classique Premium fountain pen, numbered out of 888 (a lucky number in China) each.